Rediscover the events that led directly to the US's involvement in WWII with a visit to the Pacific Aviation Museum at Pearl Harbor. Your general admission ticket covers more than 70 years of Pacific aviation history. Peruse dozens of exhibits including intact WWII Hangars 37 & 79, learn about MiG Alley, and watch the award-winning Pearl Harbor documentary 'East Wind, Rain.' Your entry also includes an audio tour available in English, Spanish, Japanese, Korean, Cantonese, and Mandarin. 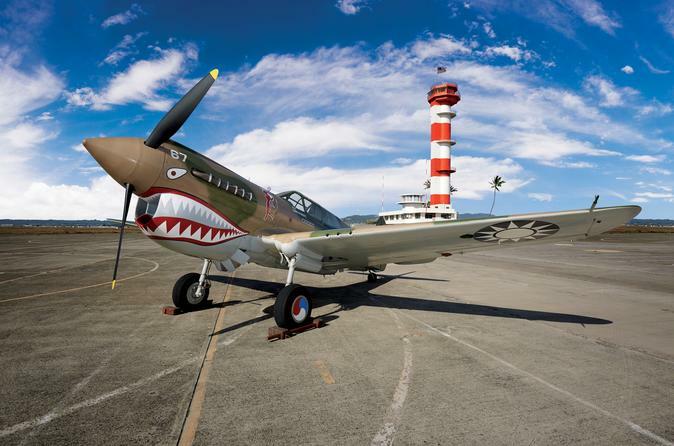 Enjoy general admission to the Pacific Aviation Museum Pearl Harbor and step back in time to discover more than 70 years of Pacific aviation history. Begin your journey at Pearl Harbor on historic Ford Island in the actual hangar that survived the December 7, 1941 Japanese attack. Peruse Hawaii’s largest collection of air crafts and learn the stories that made them aviation icons. Watch a stirring film featuring actual footage of the attack narrated by Pearl Harbor survivors. Afterward, visit the museum store for aviation gifts and souvenirs. Along with a free audio tour available in available in English, Spanish, Japanese, Korean, Cantonese, and Mandarin (ask for your headsets at the front desk upon entry), the museum is also home to a cafe.